Ingrid Bergman may have brought film-set glamour to the Aeolian Islands but they remain an unpretentious paradise for the Italian jet set. We reveal what six of the islands have to offer in this stunning archipelago. 1. Stromboli The northernmost and easternmost island of the archipelago, Stromboli emerges out of the blue like a single smoking breast of some oceanic behemoth submerged beneath. Its teat towers 926 metres above sea level, shooting magma and ash into the air for a few hundred more, and there are two further active craters. Its 500 permanent residents move about by Motorino, bici or mule: all with the same wild look in their eyes, that of people who live on the slopes of a rumbling, water-locked volcano. Its last major eruption was only seven years ago. 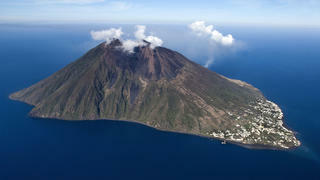 But Stromboli’s magnificence is not all in its menace. While the uninhabited southern side of the island belches soot, blackened and dead, the northern part is verdant. Palms, cacti, caper bushes, wild fennel and bougainvillea flourish in its fecund soil, which is home to the sleepy, whitewashed villages of San Bartolo and San Vincenzo. Things get conceived on Stromboli. It is here that Roberto Rossellini and Ingrid Bergman fell in love on set in 1949, and she became pregnant; where Dolce and Gabbana hole up for inspiration and Nicoletta Fiorucci hosts her month-long art symposium, Volcano Extravaganza, at La Lunatica. Don’t try to drop anchor – the sea floor falls to more than 2,000 metres. Dock at either Ficogrande or Scari to hike Stromboli’s slopes. But the best of the island is accessed only by yacht: the tiny village of Ginostra (population 30) set in a natural amphitheatre; the Sciara del Fuoco, a horseshoe-shaped depression caused by the collapse of the northwestern side of the cone 13,000 years ago; and Strombolicchio, two kilometres north east, a 45-metre-high basalt sea stack topped by a lighthouse fit for a Bond villain. Ingrid Bergman may have brought film-set glamour to the Aeolian Islands but they remain an unpretentious paradise for the Italian jet set. We reveal what six of the islands have to offer in this stunning archipelago. The northernmost and easternmost island of the archipelago, Stromboli emerges out of the blue like a single smoking breast of some oceanic behemoth submerged beneath. Its teat towers 926 metres above sea level, shooting magma and ash into the air for a few hundred more, and there are two further active craters. Its 500 permanent residents move about by Motorino, bici or mule: all with the same wild look in their eyes, that of people who live on the slopes of a rumbling, water-locked volcano. Its last major eruption was only seven years ago. But Stromboli’s magnificence is not all in its menace. While the uninhabited southern side of the island belches soot, blackened and dead, the northern part is verdant. Palms, cacti, caper bushes, wild fennel and bougainvillea flourish in its fecund soil, which is home to the sleepy, whitewashed villages of San Bartolo and San Vincenzo. Things get conceived on Stromboli. It is here that Roberto Rossellini and Ingrid Bergman fell in love on set in 1949, and she became pregnant; where Dolce and Gabbana hole up for inspiration and Nicoletta Fiorucci hosts her month-long art symposium, Volcano Extravaganza, at La Lunatica. Don’t try to drop anchor – the sea floor falls to more than 2,000 metres. Dock at either Ficogrande or Scari to hike Stromboli’s slopes. But the best of the island is accessed only by yacht: the tiny village of Ginostra (population 30) set in a natural amphitheatre; the Sciara del Fuoco, a horseshoe-shaped depression caused by the collapse of the northwestern side of the cone 13,000 years ago; and Strombolicchio, two kilometres north east, a 45-metre-high basalt sea stack topped by a lighthouse fit for a Bond villain. After Rossellini’s film brought the jet set to the Aeolians in the 1950s, they chose to buy their houses not on Stromboli but 24km south west on Panarea, a frangipani-scented paradise of film-set romance, with unobscured views of the volcano providing a permanent fireworks display. And thus the smallest island of the archipelago was established as its exclusive heart. This was crystallised by the founding of Hotel Raya by artists Paolo Tilche and Myriam Beltrami in 1958. It has since sprawled up the mountainside and garnered legendary status — despite its simple two-star rating. Don’t be fooled: in August its terrace turns into an all-night disco where kaftan-clad Neapolitan beauties sporting Panarea’s famous leather-laced sandals, fashion designers and aristocrats lounge together on sunbeds. The only way to rent a simple limestone house on Panarea is through a friend of a friend, in the same circles as residents Princess Alessandra Borghese or Irene Bulgari. 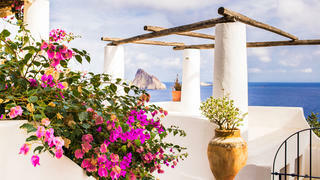 Panarea is a place of rituals. Lazy days are spent offshore exploring the rocky islets of Basiluzzo, Lisca Bianca and Batillo; perfect for a lunchtime anchor and swim, as your yacht’s chef prepares spaghetti alle vongole. The evenings begin back on shore at Bar del Porto in San Pietro for a negroni aperitivo before dinner at Bridge Sushi Bar — Dolce and Gabbana regularly tender over to eat here — followed by a night of dancing on Raya’s terrace to the primeval strobes of Stromboli. After Rossellini’s film brought the jet set to the Aeolians in the 1950s, they chose to buy their houses not on Stromboli but 24km south west on Panarea, a frangipani-scented paradise of film-set romance, with unobscured views of the volcano providing a permanent fireworks display. And thus the smallest island of the archipelago was established as its exclusive heart. This was crystallised by the founding of Hotel Raya by artists Paolo Tilche and Myriam Beltrami in 1958. It has since sprawled up the mountainside and garnered legendary status — despite its simple two-star rating. Don’t be fooled: in August its terrace turns into an all-night disco where kaftan-clad Neapolitan beauties sporting Panarea’s famous leather-laced sandals, fashion designers and aristocrats lounge together on sunbeds. The only way to rent a simple limestone house on Panarea is through a friend of a friend, in the same circles as residents Princess Alessandra Borghese or Irene Bulgari. Panarea is a place of rituals. Lazy days are spent offshore exploring the rocky islets of Basiluzzo, Lisca Bianca and Batillo; perfect for a lunchtime anchor and swim, as your yacht’s chef prepares spaghetti alle vongole. The evenings begin back on shore at Bar del Porto in San Pietro for a negroni aperitivo before dinner at Bridge Sushi Bar — Dolce and Gabbana regularly tender over to eat here — followed by a night of dancing on Raya’s terrace to the primeval strobes of Stromboli. The Aeolians offer more than the extremes of high society and natural solitude. Inhabited for more than 5,000 years, each island still bears traces of its former residents. On Lipari, the largest island in the chain, 25 rooms of relics from its chain of occupying civilisations – Greek, Italics, Saracens, Visigoths, Byzantines and Normans – can be seen at the Archaeological Museum in Lipari town, split in two by a fortified acropolis. The castle here was once used as a penal colony by the Bourbons and housed exiled anti-Fascists in the 1930s. Lunch at the acclaimed Filippino restaurant, one of the best restaurants in the world to visit by superyacht, is a must. It has been in the Bernardi family's hands for more than a century; gorge on smoked swordfish stuffed with figs and lemon rind, or grouper ravioli with capers and red peppercorns. If you have any energy after your digestivo, there are villages and beaches to explore. Centuries of pumice stone quarrying here have left fine white dust deposits on the seabed; the transparency at Spiaggia Bianca rivals Bahamian waters. The Aeolians offer more than the extremes of high society and natural solitude. Inhabited for more than 5,000 years, each island still bears traces of its former residents. On Lipari, the largest island in the chain, 25 rooms of relics from its chain of occupying civilisations – Greek, Italics, Saracens, Visigoths, Byzantines and Normans – can be seen at the Archaeological Museum in Lipari town, split in two by a fortified acropolis. The castle here was once used as a penal colony by the Bourbons and housed exiled anti-Fascists in the 1930s. Lunch at the acclaimed Filippino restaurant, one of the best restaurants in the world to visit by superyacht, is a must. It has been in the Bernardi family's hands for more than a century; gorge on smoked swordfish stuffed with figs and lemon rind, or grouper ravioli with capers and red peppercorns. If you have any energy after your digestivo, there are villages and beaches to explore. Centuries of pumice stone quarrying here have left fine white dust deposits on the seabed; the transparency at Spiaggia Bianca rivals Bahamian waters. Salina, the second biggest landmass after Lipari, is the place to immerse yourself in the unchanged rural life that subsists on its extinct twin peaks, Monte Fossa delle Felci (962 metres) and Monte Dei Porri (860 metres). On these verdant slopes, cut by ancient terracettes high above narrow swatches of black lava stone beach, capers and sweet Malvasia grapes are still farmed the old way. Salina’s unspoilt simplicity made it the starring beauty, alongside Maria Grazia Cucinotta, of Michael Radford’s Il Postino, which was shot in Pollara in 1994. This hamlet of less than 100 people lies in the crater of the old volcano and glows pink at dusk. Capers and desert wine were the island’s main source of income for hundreds of years. When a phylloxera epidemic hit in the 1890s, Salinians emigrated en masse to Australia where they started the new world wine industry. A museum at Lingua tells this story, although the main attraction here is Alfredo’s artisanal granite, in flavours from pistachio to fichi d’india — a favourite of Giorgio Armani, who sends a crew member daily to fetch him some. Dock at Santa Marina on the east coast. From here you can hike for four hours into the mists of Monte Fossa delle Felci, in forest so cool it feels air-conditioned. Food and wine is not the only way to enjoy Salina. The spa at Hotel Signum is one of the best spas in the Mediterranean and offers thalassotherapy — the ancient water treatment practised by the Romans and Greeks. Salina, the second biggest landmass after Lipari, is the place to immerse yourself in the unchanged rural life that subsists on its extinct twin peaks, Monte Fossa delle Felci (962 metres) and Monte Dei Porri (860 metres). On these verdant slopes, cut by ancient terracettes high above narrow swatches of black lava stone beach, capers and sweet Malvasia grapes are still farmed the old way. Salina’s unspoilt simplicity made it the starring beauty, alongside Maria Grazia Cucinotta, of Michael Radford’s Il Postino, which was shot in Pollara in 1994. This hamlet of less than 100 people lies in the crater of the old volcano and glows pink at dusk. 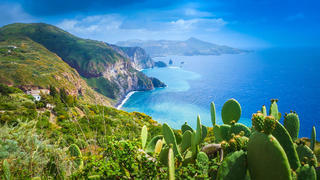 Capers and desert wine were the island’s main source of income for hundreds of years. When a phylloxera epidemic hit in the 1890s, Salinians emigrated en masse to Australia where they started the new world wine industry. A museum at Lingua tells this story, although the main attraction here is Alfredo’s artisanal granite, in flavours from pistachio to fichi d’india — a favourite of Giorgio Armani, who sends a crew member daily to fetch him some. Dock at Santa Marina on the east coast. From here you can hike for four hours into the mists of Monte Fossa delle Felci, in forest so cool it feels air-conditioned. 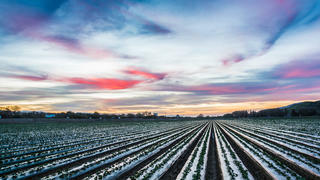 Food and wine is not the only way to enjoy Salina. The spa at Hotel Signum is one of the best spas in the Mediterranean and offers thalassotherapy — the ancient water treatment practised by the Romans and Greeks. Sail on westwards and further back in time to the most geologically ancient islands of Alicudi (population 80) and Filicudi (about 200). They are the rough-cut diamonds of the archipelago. Beachcomb for shells on their stony shores or dive into waters so transparent that snorkellers can watch grazing sheep on the purple cliffs above as they rip into lavender and wild herbs. 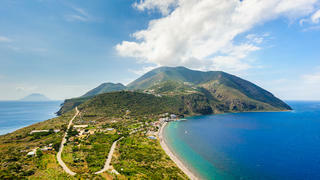 To reflect on your journey, hike to the eastern side of Alicudi. From its highest point you can look back across the aquamarine horizon to the other six islands, their pinnacles jutting through the clouds like thrones of the Greek gods.